Ben Roethlisberger's attorney says the Pittsburgh Steelers quarterback is "completely innocent of any crime." Quarterback denies allegation; attorney: "The facts show that there was no criminal activity"
(CNN) -- Authorities are no longer able to watch a video of scenes at a Georgia nightclub in the case of Pittsburgh Steelers quarterback Ben Roethlisberger because a digital video recorder system recorded over it, an attorney said Thursday. Roethlisberger, who has been the starting quarterback for the Steelers for six seasons, has been accused of sexually assaulting a 20-year-old woman at a Georgia nightspot this month. He has not been charged. 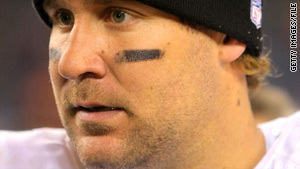 Roethlisberger's attorney has said, "The facts show that there was no criminal activity." Police were hoping to use the recording to glean any details and insights about the sequence of events surrounding the alleged incident, which was said to have occurred in a restroom. Carl Cansino, the attorney representing the Capital City nightclub, said police were able to see a small portion of the recording, and the club manager said he saw the entire video. Cansino said the club manager said the club's dance floor and entrance were in the recording during the night of the alleged assault, but he couldn't discern anything out of the ordinary. Police talked to Roethlisberger, 28, and the woman at the scene immediately after the incident was reported about 2:30 a.m. March 5 at the club in Milledgeville, Georgia, said Deputy Police Chief Richard Malone. The woman "alleged that he is the perpetrator," Malone told reporters. Attorney Lee Parks said the woman said she is "fully cooperating with law enforcement." The Georgia Bureau of Investigation said the investigation is continuing and the file will be turned over to the local district attorney when it is over. "There is a future interview scheduled at present, and she intends to keep that appointment," Parks said.